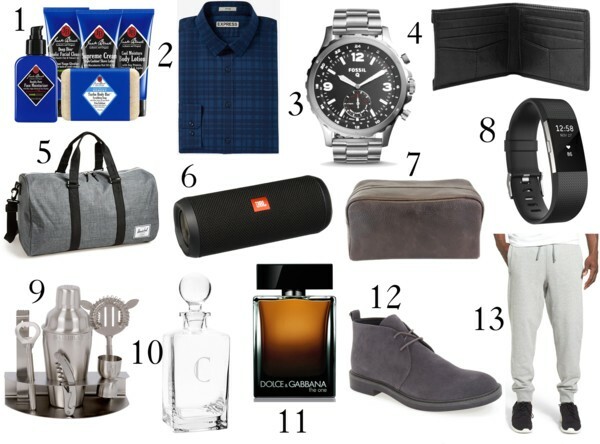 Another gift guide to share with you all for any special guy in your life! I asked my boyfriend, Nick to help me with it, so you know it's guy-approved! 1. Shaving kit: it's pretty self-explanatory. Every guy needs one! Even if they don't shave! 2. Flannel or plaid shirt: Nick shops at Express a lot- they have great shirts! 3. Watch: Fossil is my favorite brand- I got one for Nick a few months ago, and I've gotten them in the past for my brothers! They're always great quality, great prices, and have awesome stainless steel or leather options! 4. Wallet: every guy needs one! 5. Duffel bag: can use to travel or take to the gym! I also like this Nike duffel! 6. Speakers: Nick has told me that JBL are the best brand of speakers! 7. Toiletry bag: great for toiletries when traveling! 8. Fitbit: perfect for any guy who works out! 9. Bar set: I gave Nick one and he uses it all the time! 10. Whiskey decanter: perfect for any guy that likes whiskey! 11. Cologne: Nick wears Dolce & Gabbana - "The One" and I don't want him to ever change it, it smells that good! It's my favorite cologne ever! 12. Shoes: Nick has these Calvin Klein boots and I love them- they go with everything he wears! 13. Sweatpants: another necessity in any guys wardrobe!